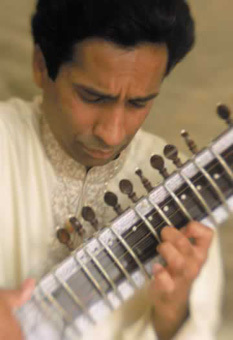 Kartik Seshadri is a world-renowned sitar virtuoso, composer, educator and the foremost disciple of Pandit Ravi Shankar. Seshadri was hailed as a child prodigy in India by critics and prominent musicians when he began performing full-length solo recitals at the age of six. His initial training in music began with Shri Shankar Rao of All India Radio, who nurtured his precocious musical abilities. Seshadri had already embarked on an illustrious performing career when in 1965 he met the renowned maestro Pandit Ravi Shankar, who was a profound musical influence in his life. In 1974, Seshadri became a disciple of the maestro and has since been receiving talim (knowledge) steeped in the distinctive and pure styles of the Senia, Beenkar and Dhrupad traditions. Seshadri performs extensively as a soloist in major venues throughout India and abroad. His concerts in India frequently include prestigious festivals such as the Sangeeth Nataka Academy, Dover Lane Music Conference, Sangeeth Research Academy (ITC Music Festival), Gunidas Sangeeth Sammelan, Madras Music Academy, Indian Fine Arts Society, and Saptak, establishing him as a musician of national importance. In the United States and Canada, his recent solo engagements have included Lincoln Center, Kennedy Center, World Music Institute, Asia Society, Vancouver Jazz Festival and Ravi Shankar’s 75th Birthday Celebration. He has accompanied Ravi Shankar in major concert halls throughout the world, from India, Europe and the Middle East, to Japan, Mexico and the United States, including New York’s Carnegie Hall. Seshadri’s performances are noted for their expressive beauty, rich tonal sensibility and extraordinary rhythmic intricacy. Most recently, Seshadri collaborated on the Orion project with the noted composer Philip Glass and the Brazilian group UAKTI with worldwide performances ranging from the Ravinia Festival in Highland Park and Brooklyn Academy of Music in New York to the Cervantino Festival in Mexico and Australia’s Melbourne International Arts Festival. Seshadri is also a distinguished composer and educator of Indian music. His composition Quartet for a Raga received its world premiere in Washington, DC under the auspices of the Contemporary Music Forum. He also teaches at the University of California, San Diego, where he heads one of the largest programs of Indian Classical music in the country. Seshadri’s latest recording Raga: Rasa- That which Colors the Mind recently earned the worldmusic’s top ten list from the prestigious Songlines Magazine in London. © 2018 Adams Entertainment, Inc.